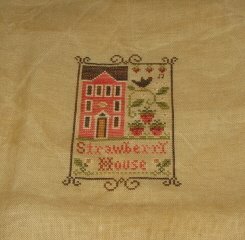 Here’s the finished pic of Strawberry House. This was such a fun stitch! I absolutely loved every bit of it! I haven’t done a LHN in so long, and I think that this has started something! I’ve got Queen Bee already kitted and ready to go…nevermind that I’m “supposed” to be working on the birth sampler for Jack so that can be finished before I go back to work on Thursday!! !